When the World Health Organization recently put out a warning about cell phone usage possibly causing cancer, many people started to worry. How much is really behind this warning? To understand any cancer risk a cell phone may cause, we have to look at how they work. Cell phones are radios that receive signals in form of what are called “radio waves” – waves of different lengths, that carry energy in the form of electricity and magnetism. What you see as “96.5” or “101.8” on the display of your car’s radio tuner is the frequency at which that specific radio wave is send out. But, contrary to radios, cell phones receive and transmit, because they use two frequencies at the same time – one for sending and one for receiving. Every cell phone is a small radio that receives a “program”, but simultaneously also a radio station, broadcasting one. The other difference to your radio is that cell phones use a form of radio waves called “microwaves”, very short radio waves, similar to those in microwave ovens. Putting it quite crudely, when you use a cell phone, you hold a very small microwave oven to your head, one with comparatively very little power. At this point, three definitions come into play: molecules, ionizing radiation and non-ionizing radiation. Molecules make up all living and non-living matter. They are constructed from atoms and each molecule has a specific blueprint about how its atoms have to be connected, to make it fit the purpose its meant for – the molecules broccoli is made up from are very different from those in your teeth. Ionizing is a form of radiation with enough energy to break the atomic structure within molecules and making random changes to it. Which of course isn’t a good idea; an uncontrolled change can cause the molecules to cease working or to malfunction and they may unwillingly hurt the organism they belong to. Nuclear radiation is a form of ionizing radiation and often results in cancer. Non-ionizing radiation has much less strength and doesn’t break the atomic bonds in a molecule, it just makes the atoms in it move. Sounds waves are one example of this form of radiation: they send energy to the molecules, which makes the molecules move, but as soon as the energy is used up, the molecules remain as before. Microwaves belong to the non-ionizing group as well, but they have one important distinction: they can indirectly generate heat. Molecules exposed to microwaves start to “swing”, in an attempt to lose the energy given to them, and begin to rapidly rub against each other. This rubbing produces heat and is the effect we use to warm food in microwave ovens. If you ever put something in a microwave oven long enough that it boiled, you instinctively know that this does cause changes to the molecular structure – the raw vegetables in a soup, for example, will come out quite tender. Microwaves themselves therefore don’t change the structure of the molecules, but the heat they indirectly produce can. Sufficient heat can easily transform all forms of matter into something different. And indeed, research showed that the area of your brain closest to a cell phone gets warmer. However, there was no evidence that this was nearly enough to cause any ill effect. 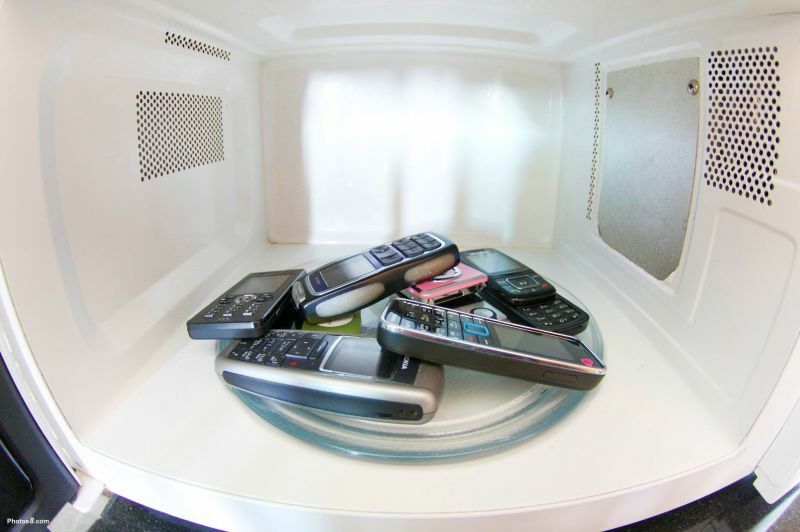 Your microwave oven may produce 1000 W, while the average mobile phone peaks at 1 – 2 W.
The evidence was reviewed critically, and overall evaluated as being limited among users of wireless telephones for glioma and acoustic neuroma, and inadequate to draw conclusions for other types of cancers. The evidence from the occupational and environmental exposures mentioned above was similarly judged inadequate. The Working Group did not quantitate the risk; however, one study of past cell phone use (up to the year 2004), showed a 40% increased risk for gliomas in the highest category of heavy users (reported average: 30 minutes per day over a 10?year period). There were suggestions of an increased risk of glioma at the highest exposure levels, but biases and error prevent a causal interpretation. The possible effects of long-term heavy use of mobile phones require further investigation. What we also have to count is the total risk of glioma: Statistically about 3 in 100,000 people develop a glioma, and a 40% increased risk would therefore push this up to 4.2 in 100,000. Putting it broader: 96% of the US population, 0r around 300 million people, use a cell phone and there annually are 8,000 cases of glioma in the United States. 40% more would be an additional 3,000 per year – if all cell phone users were affected, and not just the heavy users. If it just affected the heavy users, the total increase may be a couple hundred per year, distributed over a population of 300 million. If [the increased risk] still sounds scary, compare it to another cancer – one that I do find frightening. The number of cases of throat cancer caused by the human papilloma virus (HPV) is estimated to be about 11,300 now, increasing to 20,000 and beyond over the next few years as this infection spreads. That’s a far scarier increase than if the glioma link for cellphones is true and everybody in the U.S. is talking on their phones nonstop. If we’re going to worry about cellphones, we should worry about vaccinating boys for HPV. The WHO didn’t tell us anything we didn’t know: Evidence is not conclusive and we need more research to truly assess the risks. That quacks and “health” device peddlers of various ilk use a misinterpretation of this to sell dubious products was and is to be expected, but the scientific evidence so far doesn’t support any of their risk claims. If you want to protect yourself until more conclusive results are in, there is a simple solution: Phone less, use a hands-free accessory or simply your phone’s built-in loudspeaker function Captain Kirk style. Pictures courtesy of Sam Mugraby / photos8.com. I think the WHO could have formulated things in their press release a bit better. When you look around, it is rather frightening to see how many people suffer from cancer. Good article, and they have come up with yet another thing that could cause cancer. Btw, ”What you see as “96.5? or “101.8? on the display of your car’s radio tuner simply is a wave length you tuned the radio to”, isn’t it the frequency you tuned the radio to, not the wavelength?